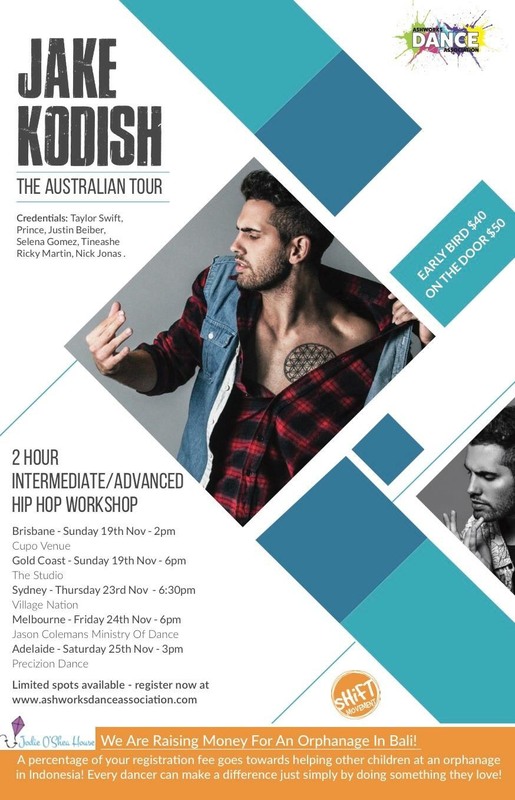 LA dancer Jake Kodish is coming to Australia! Don’t miss out on this great opportunity! Jake has worked with Taylor Swift, Prince, Justin Beiber, Selena Gomez, Ricky Martin, Nick Jonas, Tineashe, Step Up 4, Disney Channel and more. Jake currently teaches at Millennium Dance Studios in LA and various other studios around the world. PLUS! Everyone who attends the workshop will be contributing towards helping children! Ashworks donates a percentage of all registration fees to an orphanage in Bali, Indonesia! Every dancer can make a difference just simply by doing something they love! Would help immensely to get behind and support this workshop along with bringing dancers together. Head to our website now to register http://bit.ly/2yMjQY9 – Look forward to seeing you there! Ashworks Dance Association (ADA) was created in 2016 by Ashlee Lawson. Ashlee found that dancers and singers were hesitant to go to other dance workshops when being held at other dance schools due to the competitiveness and rivalry that was associated between dance schools. Ashlee decided to create a space that is neutral grounds and will bring dancers together as they all have the same love and passion for dancing and singing. As ADA is not affiliated with any dance schools, it gives dancers to be able to come together and share their passion in a friendly environment. Each year Ashlee travels to Bali to visit Jodie O’Shea’s orphanage and to take the children food shopping & supply them with any essentials they need. This year Ashlee was able to provide them with Mattresses for their bunk beds, underwear, clothing, food and cleaning products which contributes greatly with the 97 children they have living at the orphanage. Visit ashworksdanceassociation.com for more information.